Join Us for a Special Veterans Day! | Phoenix Personal Injury Law Blog - Breyer Law Offices, P.C. We appreciate our veterans! 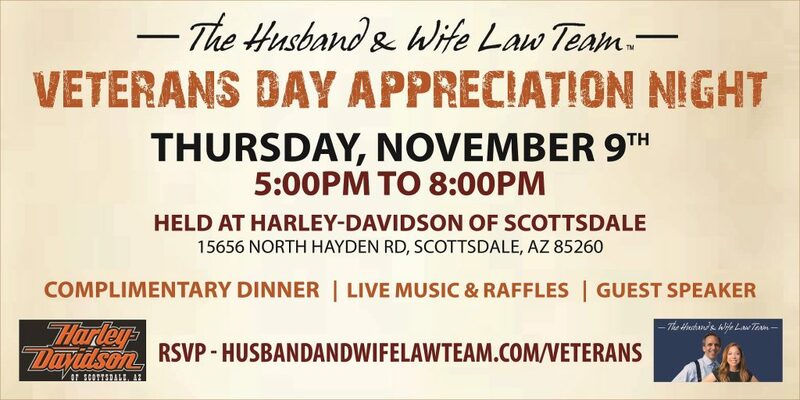 The Husband and Wife Law Team wants to thank you for your service with a free evening event on November 9, from 5 to 8 p.m., at Harley-Davidson of Scottsdale. You can RSVP and register at www.husbandandwifelawteam.com/veterans. Last year we held a breakfast event, and this year we want to step up the entertainment with an evening event featuring a live band, the Scottsdale Harley-Davidson Motorcycle Drill Team, food, live speakers, raffles, and more. The Scottsdale Harley-Davidson Motorcycle Drill Team is a performance team that trains on their own bikes (all Harley Dressers). Fans get to see them coordinate high-speed flybys, quick reversals, tight turns, and close-order maneuvers, all set to music. This team enjoys entertaining and promoting safe riding to crowds of all sizes and ages. They have been together for about three years and members have been riding an average of 33 years. They are the only Harley-Davidson Drill Team in the state (and the West). Come watch as they sync up their bikes and put their hard work and camaraderie on display! The 74th Street Band, based out of Phoenix, will play live at the event, putting their southern rock band style and high-energy performance on display. They feature a dual-threat guitar and four-part harmony vocals, energizing and entertaining any crowd. They perform regularly at nightclubs, rallies, weddings, and even private events, encouraging guests to dance and cut loose. They are considered a premier cover band, and their music often features hits from the 1960s through the present, making it accessible and enjoyable for all ages. Veterans Day annually falls on November 11, as it is the anniversary of the signing of the armistice, which brought an end to WWI. Every year, we celebrate veterans for their services, and this year, we are excited to host this complimentary event on November 9th. Come and enjoy the food, enter the raffles, listen as speakers educate and inspire, and enjoy the band and performances. Bring your motorcycle club, family, and friends. Harley-Davidson of Scottsdale is located at 15656 North Hayden Road. Don’t forget to RSVP at www.husbandandwifelawteam.com/veterans. See you there! For more details, check our Eventbrite invitation!